When a vocalist is also an instrumentalist, the value of the presentation is that much sweeter. 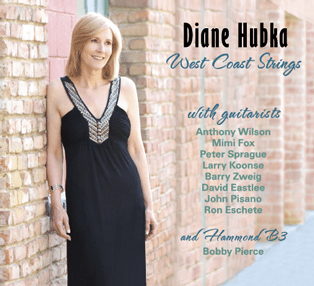 Hubka’s ability to delivery well-covered standards with a fresh sound is immediately evident in her latest endeavor, West Coast Strings. Hubka has a very light and easy style, which is extremely pleasing to the listener’s ear from the first notes. Lending a hand to the proceedings is a myriad of guitar greats, including; Anthony Wilson – tracks 1, 6, 13, Mimi Fox – tracks 2, 12, Peter Sprague – tracks 3, 7, Larry Koonse – tracks 4, 8, Barry Zweig – tracks 5, 9, David Eastlee – tracks 5, 9, John Pisano – tracks 7, 10, Ron Eschete – tracks 10, 11 and a special appearance by Bobby Pierce, Hammond B-3 – tracks 1, 6, 13. With such an all-star lineup it only cements the recordings enjoyability and listenability. This is a guitarist’s recording date dream; even Hubka lends her skills to tracks 3, 8, and 11. “West Coast Blues” a well-known Montgomery tune, is given a true reading with a swinging rendition, while Hubka eloquently states the melody with interesting vocal lines that don’t gloss over the intended lines Montgomery crafted, that made this song the classic it truly is; in the hands of Hubka the song is sweet, cool and filled with melodic delight. Wilson shows why he is a first call guitarist, lending righteous lines with precision, to the cut. Wilson takes time to develop motifs throughout the solo; especially nice was the beginning of his 2nd chorus, and his thematic development of his improvisational lines based upon the melody. The cut gets right to the heart of the song, and leaves you wanting more. “Moondance” has wonderful use of harmonics that is employed by guitarist Mimi Fox, the concept is a nice vehicle to ornament the melody and create wonderful movement under vocalist Hubka on this duet rendition. Fox also employs a nice pedal point during the chorus which further propels the cut, both show mastery of ideas. Another highlight is “Never Let Me Go,” that features guitarist Larry Koonse, creating a softly woven supportive accompaniment. Hubka, has an unaffected style that feels honest and organic, she truly conveys the story of the lyric, which at times the younger generation has lost that art form in the mix. Koonse and Hubka truly meld together in duo setting that is introspective and lends itself the story of the lyric. Hubka, turns up the heat on the last track “Someone Else Is Steppin’ In,” a bluesy number that romps and hollers, featuring Bobby Pierce on Hammond B-3, adding the right amount of groove and grease to the cut that keeps it tasty. Anthony Wilson lays down comfort food style BBQ licks that make your lips smack with the best flavored Blues with grit. A great ending for an engaging offering that traverses the many sounds of box guitar at its finest. Hubka has eloquently put together a poignant and lasting recording, that compliments her discography and continued journey of beautiful offerings.